I think I first became fascinated with champagne when I read The Great Gatsby for the first time. That is probably the reason why I always feel like a special occasion is not really such unless it includes champagne but at the same time I have come to also think of it as an everyday indulgence. 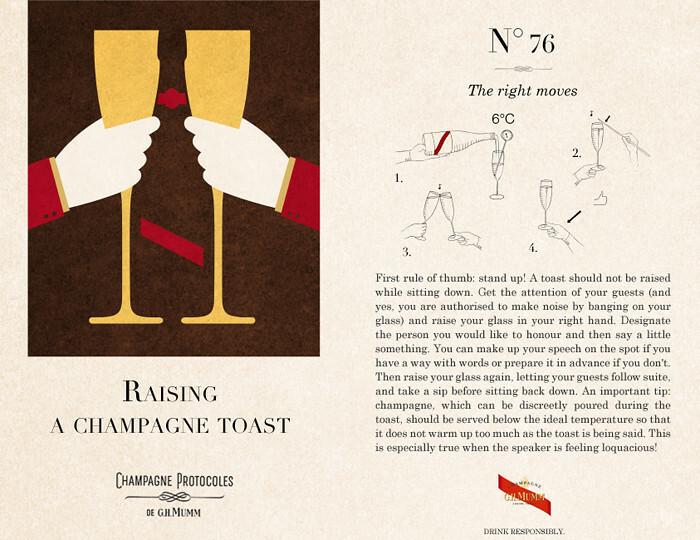 And so I am happy to participate with G.H.MUMM – one of my favourite champagne makers – in their 'Champagne Protocoles' program, which helps us to learn to appreciate champagne fully by discovering new facts about the drink as well as the Dos and Don'ts for a gentleman in different situations. You can check out all the previous chapters here. And make sure to get the G.H.MUMM Protocoles App on your iPhone to check all the chapters on the go. 75. When and who should raise the toast? Even though we are used to raising a toast at the beginning of a meal, when we receive champagne as an aperitif, this hasn't always been the case. Personally, I prefer doing it during dessert. The host should be the first to raise a toast (and the first to be served a drink), followed by the person being honoured, if there is one. The rest of the party may then take turns at raising their glasses if they wish to add a few words. 77. Should you clink glasses? When it comes to public speaking, just like with eveningwear, less is always more. A toast must be to the point and never too long, too boring or too contrived. It is a way of sharing happiness and good news, it's about being positive and giving thanks. Some people are great at pouring their hearts out. Personally, I like to convey what I mean with a meaningful look and a 'cheers! ', 'salud!' or 'chicn chin' if I'm home in Spain. Raising a toast is pretty straightforward but what do you do if you're the lucky one everyone's toasting to? Stay seated, smile and enjoy your toast. You will get to raise your glass and thank the host after he's finished. Or, if like me, you like to keep things chic and simple just return the toast with a 'thank you'. Even though toasts at weddings, birthdays, engagements or New Year's celebrations are a bit of a cliché everyone likes those moments you share on special moments. Especially when the speaker really puts something personal into his words. Personally, I love toasting to friendships, to celebrate that it's Friday or simply to seeing someone you had missed. It's easy to avoid ruining a good toast. Do not drink to your own health, a toast is about being generous! Save your first sip of champagne until the glasses have clinked. Never raise a toast with an empty glass or a glass of water! And always remember to clink your glass with everyone present, a toast is an occasion to share with others, so enjoy your contact with them.